"Mance Lipscomb was a sage, a songster, and a self-made man. He played so many types of music with powerful conviction...He brought the past to the present and turned the present into story, into song and into life." Mance Lipscomb (1895-1976), guitarist and songster, was born to Charles and Jane Lipscomb on April 9, 1895, in the Brazos bottoms near Navasota, Texas, where he lived most of his life as a tenant farmer. His father was an Alabama slave who acquired the surname Lipscomb when he was sold to a Texas family of that name. Lipscomb dropped his given name, Bowdie Glenn, and named himself Mance when a friend, an old man called Emancipation, passed away. Lipscomb and Elnora, his wife of sixty-three years, had one son, Mance Jr., three adopted children, and twenty-four grandchildren. 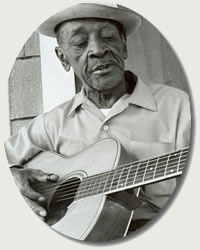 Mance Lipscomb represented one of the last remnants of the 19th century songster tradition, development of the blues. Though songsters might incorporate blues into their repertoires, as did Lipscomb, they performed a wide variety of material in diverse styles, much of it common to both black and white traditions in the South including ballads and rags. Also included were dance pieces (breakdowns, waltzes, one and two steps, slow drags, reels, ballin' the jack, the buzzard lope, hop scop, buck and wing, heel and toe polka), as well as popular, sacred, and secular songs. Lipscomb himself insisted that he was a songster, not a guitarist or "blues singer," since he played "all kinds of music." His eclectic repertoire has been reported to have contained 350 pieces spanning two centuries. Lipscomb was born into a musical family and began playing at an early age. His father was a fiddler, his uncle played the banjo, and his brothers were guitarists. His mother bought him a guitar when he was eleven, and he was soon accompanying his father, and later entertaining alone, at suppers and Saturday night dances. Although he had some contact with such early recording artists as fellow Texans Blind Lemon Jefferson and Blind Willie Johnson and early country star Jimmie Rodgers, he did not make recordings until his "discovery" by whites during the folk-song revival of the 1960s. The genius country/songster Mance Lipscomb was the most accomplished of the Texas "dead thumb" guitarists. His solid driving bass propelled his dancing, spontaneous melodies through song after song. In this DVD Ernie Hawkins carefully takes you through the complete range of Mance's playing, revealing all the tricks of the trade. Most importantly, you will learn how to play in Mance's style so that you can effortlessly adapt it to any kind of song. Tunes include: "Captain Captain, Night Time Is The Right Time, Goin' Down Slow, You Got To See Your Momma Every Night, You Got To Reap What You Sow, Sugarbabe, Cherry Ball". Taught by Ernie Hawkins. In this second DVD lesson Ernie Hawkins continues his study of Mance Lipscomb's guitar style and fingerpicking techniques. Ernie highlights the ever popular "Spoonful", two ragtime instrumentals in the key of G and A and an extended blues in the key of G - "Spoonful, G Rag, A Rag, Blues in G". Mance Lipscomb was the son of a former slave and lived most of his life in Navasota, Texas - supporting himself and his family by tenant farming while playing blues and rags at local Saturday night parties. He was discovered by Chris Strachwitz in 1960. Soon he was performing at festivals, concert halls and clubs around the country. This video presents a rare television concert recorded in Texas for LRU TV in 1969. Songs include: "So Different Blues, Take Me Back, Going Down Slow, Keep On Trucking, Alcohol Blues, Angel Child, Silver City, Night Time Is The Right Time, Key To The Highway, You Got To See Your Mama Every Night, Mama Don't Allow, Long Way To Tipperary, Baby You Don't Have To Go, When The Saints Go marching In, Motherless Children, I Want To Do Something For You".